At Home with the Hinkleys: I am in a mood. I don't know what crawled up my backside today, but I am in an awful mood. Like I just want to rip the head off of the next person who steps in my office. For no reason, of course. 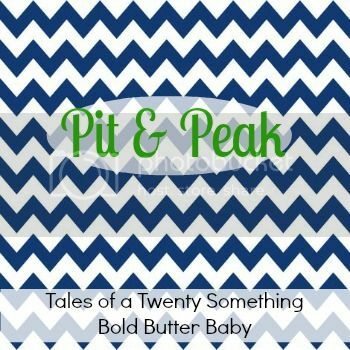 So it is a good day to link up with two link ups of the same gist - Allie and Brin have Pit& Peak, Stephanie and Sarah have happies and crappies. *Today is Friday and also my boss is out of the office. So all I want is to be left in peace so I can read blogs and do my thing, yet the phone hasn't stopped ringing and everyone is bothering me for stuff left and right. Is it so much to ask that you know how to do you job or find an answer without having to involve me?? ugh. *I need to get a 'passport' style photo taken for my application to the state board to get going for my CPA exam and the days I have time to do that on my lunch break are days I am rockin a gross ponytail and looking like garbage. The days I dressed like an actual person with a professional job, I didn't have time to get it done. I will get this done Saturday. *You know those fruit & yogurt parfaits that McDonald's sells? Well I knocked one off my desk this morning onto my shirt, inside my shoe, the carpet, the wheel of my desk chair, etc. I am so over today. I am a deflated balloon. *It is my anniversary weekend! We made it! Hope your day gets better!!!! Oh NO! I've dropped one of those parfait's as well. It's a mess! Friday is also normally my slow day to read blogs. Unfortunately, you and I are in the same boat, my phone hasn't stopped ringing!!! OMG GUrrrl I totally feel ya...that's how I felt on Wednesday and I just hated the entire world! I think it's just the winter doldrums you know? Hi! I am a new follower stopping by from Pit and Peak. Happy Anniversary! Happy anniversary!! We celebrate ours in March! Eeeek! Thanks for linking up with Happies and Crappies.